Between scary adverts about depriving your child of much-needed vitamin D and even scarier adverts about sun protection, what’s a parent to do? The ideal solution is to provide an option for shade and shelter during the hottest part of the day, and the best beach tents provide both of those things in spades. Of course, it’s even better if we follow that advice ourselves, so we’ve included some of the best beach tents for adults too. You’ve got shelter covered, but what about food? These are our best portable barbecues for the beach and the back garden. For babies and toddlers, your best bet is the Babymoov Anti-UV Tent, or for small infants, the Kilofly Original Instant Pop Up Travel Baby Beach Tent. Both offer protection from UV rays and bugs and aren’t too heavy to lug down to the sands with you. If you’re looking for an adults’ beach tent, it all depends whether you prize space, weight, or easy up and down above all else, although there are some models that do a combination of these things admirable. Keep reading below to learn more. Reviewers raved about this tent as a safe, comfortable base for little people, especially babies and toddlers, on hot and sunny days. It packs into a compact, circular case with shoulder strap for easy carry, and reviewers said that while the first time folding it could be a bit confusing (there are YouTube videos dedicated to the art) once you get the hang of it, it’s a doddle to put up and down. With a 50+ UPF rating and mesh ventilation panels that keep bugs out but let you see in, they’re free from harm but easily within arm’s reach, and the mere 700g weight helps too. For single-handed trips, nothing beats a tent that goes up easily. Unlike the Coleman Sundome’s pop-up cousin, this version doesn’t come with poles pre-attached, but reviewers did commend it for how easy it was to put up, and the strength and flexibility of the steel and fibreglass poles. All this does, of course, make it a bit heavier than the average offering, but testers found the quality of it tangible, so that sounds like a pretty good trade-off. As well as packing in SPF 50 UV protection, the shelter can be fully zipped up for extra wind protection while those poles hold it firm. Taking a baby to the beach can be an undertaking and a half, but the Kilofly Original offers a pretty capable helping hand on the transport, sun safety and detaining fronts, at least. Reviewers said this baby-sized beach tent was just the right size to keep a single tot (maybe twins at a squeeze) safely contained, with mesh sides to keep bugs and flies at bay, and UPF 35+ sun protection to keep them from getting burnt. It’s also the lightest beach tent on our list, so if you’re already weighed down by other baby paraphernalia, it won’t make too much of a dent. Size: H43.5 x W59 x L65in. Reviewers found this beach shelter easy peasy to put up and take back down again, which should be music to the ears of any harried parent, especially those who’ve had the experience of trying to stuff a beach tent in its own bag only to find it’s seemingly tripled in size. The UPF rating of 50+ keeps them covered on even the hottest days, and with the inclusion of sand pockets and normal tent pegs there are tethering options for the beach and other soft ground too. It’s certainly a shelter rather than a full-blown tent as it doesn’t zip all the way around, but to keep kids in the shade while still feeling sociable, it does the job. This geodesic dome-like tent might look like something you’d expect to find on a commune in the California desert, but it’s really quite a sensible option for family trips, whether that’s a day at the beach or a camping holiday. Usually you can expect pop-up tents to be on the smaller side as a trade-off (see below) but this oversized shelter makes no such concessions. With enough room to fit two comfortably, or as a separate base for kids and pets, reviewers say it’s surprisingly lightweight for the size and best of all, amazingly easy to put up. Size: H35 x W59 x L59in. 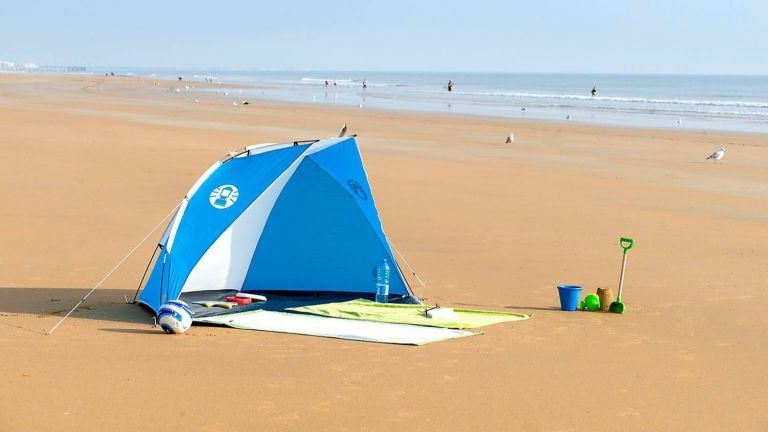 With its neat circular carry bag and instant pop-up design, this beach tent is easily one of the most compact and convenient options out there. Coming in at just under a kilogram, it’s not the very lightest, but it’s a small price to pay for the ease of the whole operation, which reviewers say is considerable – there’s even a set process for breaking it down and putting it away, which can be the most frustrating bit. Its manufacturers say this tent will fit two to three adults, although we think it could come in especially handy for kids, considering its 50+ SPF and agreeable amount of ventilation to keep them comfortable on hot days. While far and away our heaviest beach shelter, the SKLZ Sport Brella justifies its own heftiness easily enough. For one, it’s huge, tall enough to accommodate an adult in a camping chair and wide enough for three to sit comfortably. For two, it’s impressively rugged, with an innovative umbrella design that encompasses side flaps for full-coverage protection and, we suspect, to ensure you won’t get blown away. It comes complete with two sets of spikes to suit all sorts of ground, so it could come in very handy as a camping shelter too.